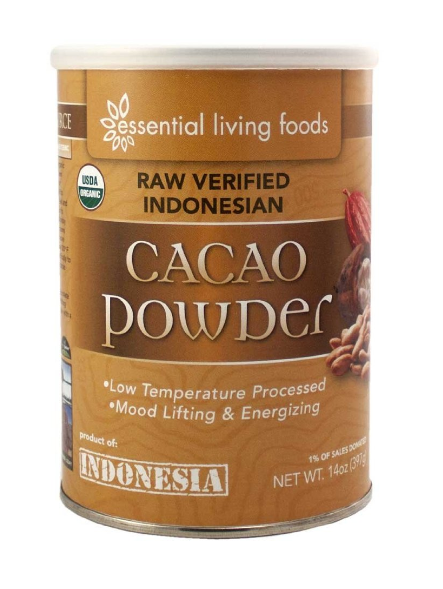 Blog posts tagged "raw cacao"
What is so special about Raw Cacao? Have you ever wondered what is so special about raw chocolate? About 8 years ago there was a big stir in the raw food world when Davide Wolfe, a big raw chocolate fan, tried his first raw cacao smoothie. This was in Maui and since David began introducing the world to raw chocolate the world has not been the same. There is something extra special about Chocolate and if you've ever had a raw chocolate fruit you know. There is magic in those chocolate pods. 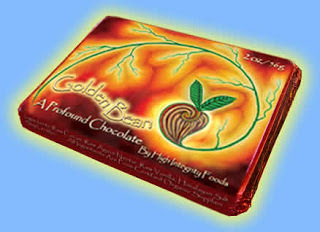 Fresh chocolate beans have a distinct violet color, which is very uncommon in foods. The uncommon nature of chocolate is also reflected in its ultra high anti-oxidant content. Many years ago when raw chocolate was just hitting the stores, I was working for Nature's First Law. As part of the early team of raw chocolate pioneers, I conducted a lot of research into the health benefits of this super food. And, one of the most astounding facts I continued to come across was that Chocolate is an Amazing Anti-Oxidant. Yes, it is true, Chocolate is ranked #1 in anti-oxidant flavoniod compounds. Chocolate has more anti oxidants per capita than any other food! The anti oxidants in chocolate account for up to nearly 10% of its total content. That means chocolate is about 10% anti-oxidant, this is a staggering percentage, something that is rarely encountered in a food. Early on in my research I learned that the milk fats used in making certain chocolate inhibit the anti oxidant capacity of chocolate. This early research I came across was all conducted with regular cooked chocolate. They had yet to discover the powers of chocolate in the raw. The antioxidant compounds found in unprocessed chocolate include heart healthy phenols, of which chocolate seems to have the most. Further investigation into the world of chocolate and health reveals what most of you can intuit. That is the less processed chocolate is the better it is for you. So as processing increases health benefits decrease. At the very top of the list would be fresh raw chocolate straight from the jungle, next would be raw chocolate beans and nibs and next on the list would be raw chocolate powder. Chocolate is often associated with love and comes in heart shaped boxes, this interesting correlation pairs well with modern research. Which has noted that the anit-oxidants in chocolate are particularly good for the heart. The compounds in chocolate help to reduced blood pressure and have a positive effect on cholesterol. Now you can enjoy the heart loving benefits of chocolate in its most pure raw form when you choose either the raw nibs or raw cacao powder. Zebra Organics start with a mission, to offer and share a variety of Healthy Living Products. This includes raw/live foods, all natural body and skin care products and hand picked supplements. Here is a sample of some of the wonderful variety of hand picked products we specialize in. chocolate bar is hand poured & hand wrapped. helping prolong and protect the resilient beauty of youthful skin, making you look and feel younger. Our anti-wrinkle cream is light, smooth and so silky! Heal the damage caused by stress, pre-mature aging and sun damage, all naturally. (a natural organic sulfur), Serum C (VC-PMG a highly absorbable form of vitamin C) and Hydroxyprolisilane-C (a double collagen booster). It also contains Liposomes, that are microscopic packages that deliver skin care ingredients into secondary layers of skin. Apply morning and night and you will begin to see results in as little as 4 weeks. from the pickling of umeboshi plums. Its year-long fermentation process brings out its fragrant, lively tartness and subtle herbal flavor. Use Oindo Ume Vinegar in place of soy sauce or seasonings. It’s delightful in soups, salads or sprinkled on greens. "Fresh Harvest Captured" concentrated raw superfood requiring no refrigeration. The nano particulate size of the NEW Nannochloropsis Gaditana strain is even smaller than previous strains. This means there are a greater number of of Marine Phytoplankton Cells in Oceans Alive. The product viscosity is a slightly thinner consistency... for faster absorption. increased levels of energy, better sleep and whole body strength. Ocean's Alive contains the highest quality of this crucial micro algae. Chocolate and Valentine's Day, like hand in glove. Truth be told chocolate is magical, I say this because it contains some really interesting compounds not found in other foods. These compounds are referred to as "Bliss chemicals" and rightly so, as they have a strong bio-chemical link to elevated states of consciousness. Chocolate is also extremely dense in antioxidant compounds known as flavonols, chocolate is also a good source for the heart healthy mineral magnesium. Chocolate unites two important factors Pleasure and Health and chocolate does it with so much grace and mystique no wonder it has its own holiday, Happy Valentine's Day! 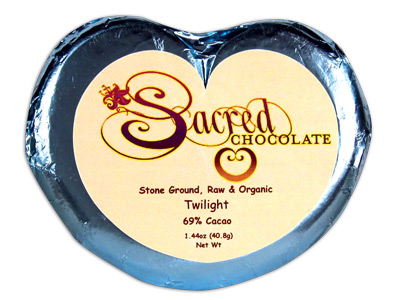 Heart shaped, delicious and full of love, give the gift of Sacred Heart Chocolate to that special someone this year. Phenylethylanmine(PEA): This interesting compound both stimulates endorphins and potentiates the activity of dopamine, these are both associated with feelings of pleasure. PEA reproduces the feelings of 'fall in love', while this may seem fanciful, there is a reason Americans give heaps of chocolate to loved ones on the 14th of February. PEA also assists with enhancing focus and alertness. Aanadamide: This is a cannabiniod compound and its effects are entirely positive. Ananda in Sanskrit means bliss and this compound is known to elevate mood, decreases depression and contribute to feelings of elation. Research is now linking the antioxidants in cacao to cardiovascular health.Chocolate is loaded with flavonols special compounds which support heart health by strengthening artery walls, increasing blood flow and improving circulation. * Eating chocolate that has been minimally processed provides the most benefit. Chocolate is also rich in Magnesium an important mineral. The flavonols in chocolate also increase blood flow to the brain. So if you are looking for an extra cognitive boost about one ounce of raw dark chocolate can help. By dilating blood vessels oxygen and blood flow is increased to the brain, this increase could come in handy for studying or when are in the middle of a mentally demanding task. Above and before any of the modern research chocolate has always had an uncommon allure. It is a food rich in myth and symbolism it is a food that borders on mystical, it's Latin name Theobroma translates to "Food of the Gods". Without even knowing it, marketers were on to something with the red heart shaped boxes. But, let it be known that not any old chocolate carries such magic. You need to be vigilant in your selection: things to look for Raw and/or Organic, high cocoa content and minimally processed. 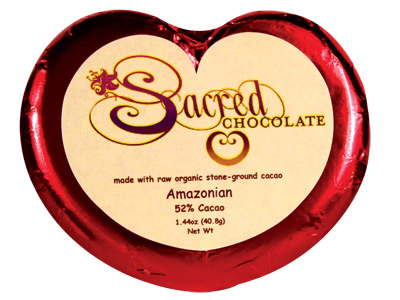 By purchasing raw, organic chocolate you are assured to receive a truly healthy product. This Valentine's Day savour a few ritual bites of chocolate and indulge in the magic. *As reported by the Cleavland Clinic.